Host Factory Review 2019: Is Host Factory a Good Hosting? If you want a competitively priced and exceptionally competent web hosting service from a Swiss-based company, then Host Factory is a sound option. They provide highly configurable Windows or Linux web hosting and dedicated servers. Established in 2003, Host Factory is a Swiss provider of web hosting and dedicated server products based in Zurich. They are a competitive and professional provider with affordably priced products that cater to their customers’ needs with high-end servers and features. They have served more than 15,000 customers with 22,000+ web hosting solutions. Their data centers are located in Switzerland, and they provide their services in Swiss German. The 1-click installer allows you to install any web hosting application you like, plus your choice of CMS such as WordPress, Joomla, or Drupal. Another great option is the Weebly website builder that boasts beginner-friendly features, templates, and a drag-and-drop builder. Host Factory also has a fantastic customer portal with an administration dashboard to manage all your products, services, add-on purchases, and accounts. It’s great that you can choose your OS as well as your server backup schedule. The web hosting option for their web server products is good, because this isn’t always offered with these types of products. Host Factory offers web hosting and server products. The web hosting products come with a 30-day money-back guarantee, but there is no refund policy for their dedicated servers. All plans come with a choice between Linux and Windows, with the dedicated server plans offering different flavors of Linux. Unfortunately, they only have long contract periods of a year or two years, but you can opt for anything from monthly to yearly billing. Web Hosting: Comes with Cron jobs, SSH, and a Let’s Encrypt SSL certificate. Choose your operating system (Windows/.NET or Linux), your number of domain accounts (2 to 250), storage (2 GB to 250 GB), and whether you want SSD storage. There are three standard configurations you can choose from. Reseller Hosting: Works exactly the same as normal web hosting but with tools to help you manage sub-accounts for customers. Dedicated Server: Server space with full root access. You can opt for a clean server with no initial software installed, or for a web hosting option with Plesk as your management software. Choose up to 75GB of storage, 2GB to 16GB RAM, and 1 to 4 CPU cores. You can also choose your OS and your snapshot backup options. 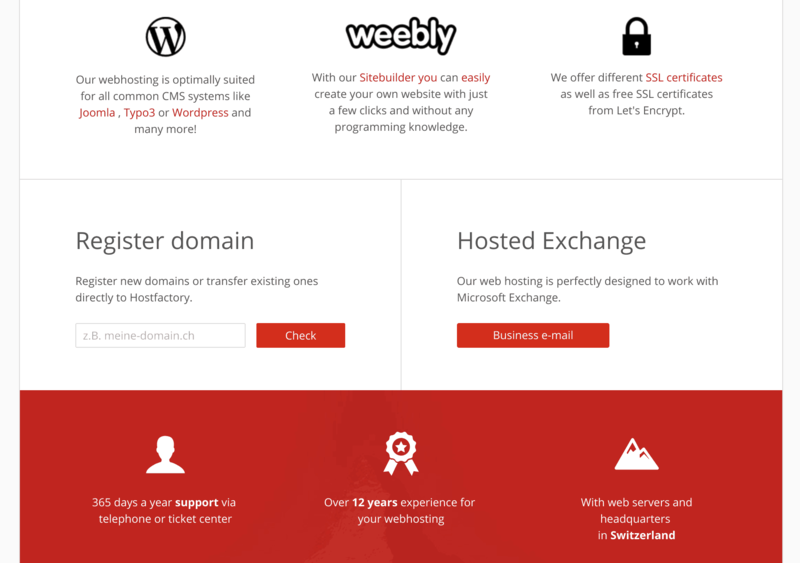 The prices are surprisingly affordable for a Swiss-based hosting company, and are consistently below the industry average. Several payment methods are supported, including PayPal, Mastercard/VISA, and Rechnung. Host Factory offers 24/7 support via email/ticket, plus phone support during office hours (09:00-17:00) on weekdays. If you submit a ticket after hours, you might find that it gets answered the next day. Despite this downside, I’ve only ever had positive experiences when working with the excellent technical support staff. The FAQ and knowledge base sections of the client area are decent enough, but not quite as comprehensive as I would like. Although they might not have the most available support, Host Factory is still an extremely customer-orientated and professional hosting provider. What’s even more surprising is how affordable their products are considering the location and the quality. Wondering how Host Factory stacks up against other Web Hosting companies? Enter any other Web Hosting company and we will give you a side-by-side comparison.